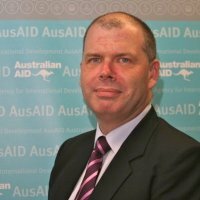 Michael Wilson is Assistant Secretary, Governance, Fragility and Water Branch in the Australian Department of Foreign Affairs and Trade. Michael joined the former Australian Agency for International Development (AusAID) in 2005 and managed branches responsible for multilateral engagement, humanitarian and disaster response, communications and public affairs, ministerial and parliamentary services and bilateral programs across south-east Asia and the middle east. From 2011 to 2014, he was responsible for the Australian Government’s bilateral and regional aid programs in mainland south-east Asia, based in Hanoi, Vietnam. Prior to joining AusAID, Michael was Principal Policy Adviser on national security and international law enforcement policy with the Australian Federal Police (2003-2005) and Director of the Multilateral Section of the Australian Department of the Environment and Heritage (1999-2002). He began his public policy career as an adviser to senior Australian Government ministers in the arts, heritage, trade and environment portfolios and has also worked in the private sector as a Principal Consultant for multinational executive recruitment and talent management company Hudson Global.